I have always love a classic white bathroom. However, this striking bathroom caught my eyes! 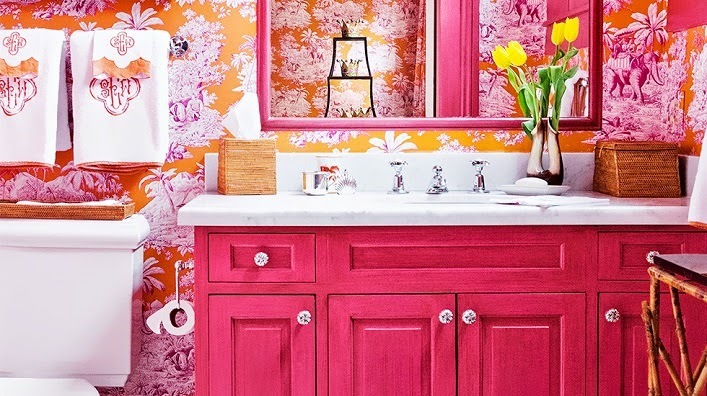 I just love the vibrant fushia cabinets against the bold patterned wallpaper. The monogrammed towels in coordinating colors were a great touch. 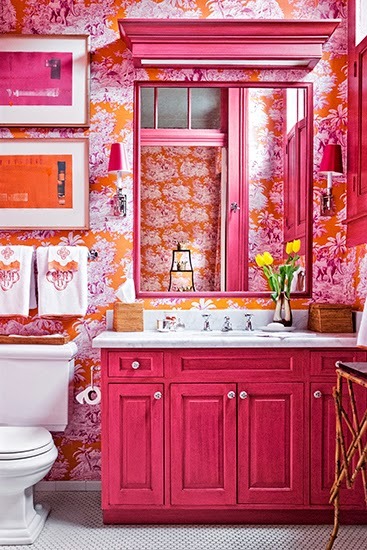 Do you love this bright and beautiful bathroom as much as I do? Would you decorate your bathroom with full-blown feminine elements (using girly colors like pinks and purples along with a bold floral wallpaper) if your partner doesn't mind and money is no object? Do tell! I don't think Rob would be able to handle having a bathroom like this, but I think it looks amazing! That cabinet color is gorgeous and I love how unexpected it is. I'd definitely be jolted awake every morning if this was my bathroom! That is one of my all time favorite bathrooms.